The following is a revision of an article I wrote for Engineered Systems Magazine in 2004. This many years later, and there is still ample opportunity for utilizing steam as a medium for industrial heating. In designing for heat transfer in HVAC systems, steam is an effective and efficient medium. However, steam is often overlooked for hot water. While there are historical problems with traditional steam heating methods, these problems, if identified and considered in the design process, can be overcome. A majority of the energy used in industrial and institutional buildings is used for space heating, a majority of that is provided by boilers1. The trend in most new construction is toward hot water heating. However, steam has five to six times the potential energy of an equivalent mass of hot water and is easier to control. Considering the crunch most operations find themselves in, between increasing energy costs and decreasing O&M budgets, the efficiency and simplicity of steam merit consideration. Compared to hot water, there are several advantages to steam. Due to higher energy content per mass, the required heat transfer area is smaller, heat coefficients are higher, distribution pipes and necessary plant sizes are smaller. Rather than costly circulating pumps and the relatively larger components needed for hot water systems, steam is distributed and controlled through pressure differentials. However, utilizing the heat of steam requires its condensing, which can be troublesome. In fact, condensate and its removal are the source of most of the problems associated with steam heating. To effectively take advantage of steam’s higher energy content and flexibility, the byproduct, condensate, must be controlled and utilized so as not to hamper heat transfer, or, worse, lead to frozen or damaged coils. In the boiler, non-compressible water becomes the compressible gas, steam. The higher the steam pressure, the higher the sensible heat and the lower the latent heat content. As pressure increases, and latent heat decreases, volume in cubic feet per pound decreases. Therefore we can generate steam at high pressure and distribute it with smaller piping. However, a higher latent heat is desirable at the source, so we reduce the pressure before the heating coil to take full advantage of steam’s heating potential. The pressure differential across the pressure reducing valve and the pressure drop from the steam moving through the distribution pipes and condensing in the coil ensures flow. Since steam gives up its energy through condensing, the process of latent heat, it provides heat at a constant temperature. This is a significant benefit. It makes for a more efficient, easier to control, process. As compared to hot water, steam responds much quicker to changes in demand. However, as noted, the condensate byproduct can be problematic if not handled correctly. The latent heat of steam at any given pressure can be found in the steam tables [link]. Calculate condensate load based on the coil’s highest operating pressure. A good rule of thumb for steam traps is to use a 2:1 safety factor at 1/2″ psi pressure differential for 0 to 15 psig steam. On systems utilizing 16 to 30 psig, a safety factor of 2:1 at 2 psi pressure differential should be used. For systems operating above 30 psig, a safety factor of 3:1 at half the maximum pressure differential across the trap should be used. While the science of steam trap application is a subject all to itself, it can be noted that in nearly all HVAC applications a float and thermostatic steam trap, sized for the appropriate safety factor, will work well. The float and thermostatic steam trap is fairly resistant to dirt, works well under modulating loads, and does a great job of handling the other potential trouble spot, air. Air can be just as insidious and potentially dangerous as condensate to the proper operation of a steam heating system. However, in a properly designed system, air can be controlled and for the most part eliminated. Air in a system cannot be totally avoided. It is a natural byproduct of steam generation. It is present during equipment start-up and is often found in feedwater. Air and other non-condensable gases can serve as insulators between the steam and the coil surface, thereby decreasing efficiency. Worse, dissolved carbon dioxide and oxygen in condensate form a corrosive carbonic acid that can eat through pipes and tubes. Therefore, it is just as important to remove the air from the system as the condensate. While the thermostatic air vents that are integral to float and thermostatic steam traps work well to remove air and other non-condensables, it is advisable to install auxiliary air vents with steam coils. The recommended location for an auxiliary air vent is on the condensate line at the top of a riser located 12 to 18 inches above the bottom of the coil, before the steam trap. In systems that operate at pressures lower than 15 psig the outlet of the air vent should be piped to the condensate return. All steam coils should have a vacuum breaker installed. Control valves, isolation valves, and the process of shutting the system down can induce situations wherein coils operate at sub-atmospheric pressures. To prevent coil collapse and keep condensate moving, vacuum breakers should be utilized. Vacuum breakers can be installed in the piping immediately before the coil or in the condensate line before the steam trap. Whenever steam supply pressure falls below atmospheric the vacuum breaker will open, inducing air into the system and breaking the vacuum. While this may seem counterintuitive, considering the dangers of air in the system, it is much more important to keep everything moving, avoid a potential coil collapse and or frozen coil, and deal with the air through venting. When heating with steam, as with any other medium, some part of the system must be manipulated or modulated to control setpoint temperature. The most common way of doing this with steam has been to modulate flow with a control valve. On steam coils this presents a unique difficulty. Since steam’s potential is best optimized at a low pressure, most steam heating systems are designed for 30 to 15 psig or lower. Once the heated space begins to reach setpoint the control valve will modulate down, lowering steam flow through the valve. Eventually the supply pressure may be reduced to operating either at sub-atmospheric pressures or below the back-pressure in the condensate return line. At this point the coil is in a condition of stall and condensate will begin to back up into the coil. It is at the point of coil stall that the major problems of heating with steam begin. Condensate that backs up into, and stays in, the coil is subject to freezing. Of course a vacuum breaker will break the vacuum and force the condensate out of the coil, under atmospheric pressure. But the condensate system will need to be operating at a back pressure that is below atmospheric and utilizing gravity to drain all the condensate from the coil. In most cases this is not enough to remove all the condensate. And any condensate left is subject to freezing. Additionally, the cracking of the vacuum breaker induces air into the system which has corrosive and insulating effects. This is not to say that vacuum breakers are not worth using, nor that air can be totally avoided. That is generally not the case, and, as stated above, the air can be dealt with. Rather, the point being made is that it is a better practice to avoid coil stall altogether, and stick by the maxim of efficient steam coil heating, keeping the fluids moving2. An alternative approach that does not require the modulation of steam flow, and has met with some degree of success, is the built-up face and bypass system utilized in some air handlers. This type system employs a bypass system with a set of dampers to direct incoming air either over the coil or through the bypass depending on demand. This type of system provides a better alternative because the air flow over the coil is modulated for temperature control and steam flow is kept constant. Constant steam flow keeps the condensate and non-condensables moving and out of the coil. 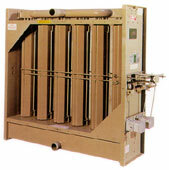 Air flow is directed by the dampers which are controlled based on leaving air temperature. The downside to these systems is that they require a considerable amount of physical space in an air handler, have variable static pressure drops, and often have considerable temperature overshoot in the bypass mode. While efficiency is gained on the steam side, it is compromised to some degree on the air side3. An efficient way to capture the energy benefits of steam and keep the condensate moving is with the integral face and bypass steam coil. As the name implies, the face and bypass dampers in the integral face and bypass steam coil are integral to the coil. This results in a compact and efficient system. Steam flow is kept at a constant. The leaving air temperature is maintained by proportioning the entering air through the multiple heating and bypass chambers in the coil with the dampers. The IFB face and bypass dampers operate like clamshell dampers in that they enclose the coil area when in the full face mode and block off the bypass channels when in the full bypass mode. In actual heating operation they are usually somewhere in between, providing the correct proportioning of air to maintain the necessary leaving air temperature. An air stream thermostat senses the leaving air temperature and signals the modulating motors which control the operation of the dampers. This provides a constant discharge air temperature, regardless of variations in entering air temperature. The benefit to an integral face and bypass coil over a built-up face and bypass air handler is in space utilization and operating efficiency. The integral face and bypass coil takes up less space in an air handler. Additionally, integral face and bypass coils can be installed in ductwork as preheat or reheat coils. Airflow and pressure drop are at a constant volume, regardless of damper positioning, usually 0.15” w.c. or less. In the complete bypass mode temperature override is minimal, generally 3-4 degrees F maximum. No further controls, other than a vented steam trap, are needed. For further freeze protection, a freezestat can be used which will place the unit in the full bypass mode upon the loss of saturated steam temperature in the tubes. Getting the steam to, and all the condensate out of, the coil efficiently is the toughest part of the steam heating job. Continually doing so will result in an efficient system. Thus, to complete the loop, and further protect the coil from being flooded, the condensate has to be returned to the plant. Like any other component of steam engineering, condensate management is a science all its own, and much can be said about it. Without getting too far a-field, we will cover the basics of condensate management, especially as they apply to HVAC applications. After all the work accomplished by the steam in the heating coil, as much as 25% of the energy originally produced in the boiler is still available in the condensate. In terms of efficiency, we want to get as much of that energy as possible back to the boiler. In terms of system performance, we want to do it the best way. Recaptured condensate is essentially boiler feed water that does not have to be treated or heated. Condensate at 212 degrees has 180 BTUs per pound of sensible heat. In plain and simple terms, this is sensible heat that does not have to be added to boiler feed water that may come in the building at 50 degrees or so. Condensate also retains most of the boiler treatment chemicals used in the system. It only makes sense to return all, or as much condensate as possible, to the boiler. However, it must be done correctly. One of the most common mistakes made in designing condensate return systems is to size condensate lines based on water flow. Hot condensate discharging out of high pressure steam traps into low pressure condensate return lines is subject to flashing. Typically, the amount of flash steam in a condensate system is 10-15% by mass. The specific volume of flash steam is 26.8 cubic feet per pound, as compared to .016 cubic feet per pound of water. Herein lays the problem. Condensate lines sized solely on water flow are insufficient to handle the accompanying flash steam. Condensate lines should be sized to handle two-phase flow by determining the quantity of flash steam inherent in the system, and sizing the return line for velocities between 4,000 and 6,000 ft/min. The line size on the discharge side of steam traps should also be increased to accommodate flash. If the heating coil shares the condensate return system with other steam equipment operating at various pressures, the condensate should be returned to a vented receiver and pumped back to the powerhouse from there4. Again, the goal is to keep low pressure in the condensate return system, and to keep it flowing. Steam has a long history as a heating medium. It has been used most successfully in industrial and institutional applications. Considering the demands of ASHRAE 62, ever-rising energy costs, the increasing pressure on O&M budgets, and the benefits of an efficiently designed steam system there are good reasons to consider steam heat more often. Many contemporary projects utilize boilers to produce steam which in turn heats water for a hydronic heating system. Using the steam directly is a better choice. Besides higher heat coefficients, the energy lost in the conversion process can be capitalized by using the steam directly. And additional savings can be found in the elimination of the heat exchanger and water pumps, the use of smaller distribution pipes, and simpler, more efficient controls. Specific applications such as gymnasiums, dining facilities, and auditoriums which generally require air handlers and large quantities of outside air are especially good candidates for steam heat utilizing integral face and bypass steam coils. Reliability and maintainability are always concerns with mechanical equipment, especially considering most maintenance personnel and capabilities are stretched thin. This is where the face and bypass steam coil can really pay off. Because of the simplicity and accuracy of the controls, and provided the rest of the system is designed to keep condensate moving, an integral face and bypass coil heating system is relatively trouble-free and easy to maintain. While it is obvious that every heating application is not suited for steam, there are likely many more applications than are currently realized. The economic benefits in terms of equipment costs, energy utilization, and operating maintenance of a properly designed system make steam, one of the world’s oldest technologies, still relevant and beneficial in the twenty-first century.